In law enforcement circles across the United States, a quiet debate continues to take place about the brotherhood of the "thin blue line" and professional courtesy among police officers. At the heart of the discussion is the question of whether police officers should receive leniency if they commit traffic violations and even some misdemeanors, particularly in light of the tough job they have and the importance of "sticking together." Professional courtesy is not unique to law enforcement; a certain kindred spirit certainly exists across nearly all professions. Waiters, for example, often tip fellow waiters better when dining out. Hospitality industry workers may often "take care" of their fellow workers by giving them free drinks or enhanced service. Historically, doctors have offered free services to fellow physicians and their family members. The fact is, people who perform the same or similar jobs have a certain appreciation and understanding of what they deal with from day to day, and they have a natural inclination toward empathy and a desire to help each other out. Considering how tough a day in the life of a police officer can be, it's no small wonder that fellow officers may be inclined to look the other way when their "brothers and sisters in blue" commit minor violations and infractions. In law enforcement, though, the public expects their officers to be held to a high ethical standard. In order to perform their jobs and accomplish their mission of improving public safety, officers rely on the public's trust. Part of that trust entails an expectation that officers will follow the law and lead by example. Most often, professional courtesy for police officers is given—or at least expected—in traffic stops. You've no doubt seen the "thin blue line" stickers on the rear windows of cars in traffic. Many officers and public safety professionals display the seemingly innocuous sticker as a symbol to other officers that they're "on the job," a phrase applied to those who work in law enforcement. The expectation is that other officers will be lenient because "we're all in it together." In most circumstances, officers are granted broad discretion in what laws they enforce and how they enforce them. Citations, arrests, notices to appear and written or verbal warnings are all on the table in most instances. Knowing that a violator is a police officer can often influence another officer's decision on how to use his or her discretion. Leniency for Cops - Right or Wrong? But is it right? Should police officers receive special consideration? Or should they be expected to follow the law - all laws - just like everyone else and to receive the same consequences as everyone else? 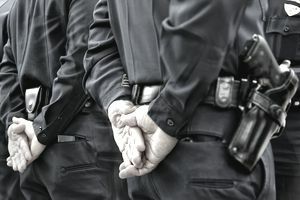 While it may be reasonable for officers to expect some consideration, some law enforcement professionals get downright angry when they or a member of their family receives a traffic ticket or even a written warning. Officers who write tickets to other officers are sometimes called "rats" or worse, and there are some who strongly believe that under almost no circumstances should an officer take enforcement action against another, whether on or off duty. In truth, this notion flies in the face of why officers choose to work in law enforcement, to begin with. It also undermines the trust the public has placed in the profession. The fact is, officers are expected to be exemplary in following the law so that they can have credibility when they enforce it. Failing to adhere to the law, or be held to the same or higher standard that we hold the public to, takes away from the ability of officers to effectively enforce laws and thus takes away their ability to safeguard lives and property. Rather than express anger at another officer for failing to provide a professional courtesy to another, the outrage is better directed toward the person who placed the officer in that position, to begin with. In short, regardless of your profession, if someone does not want to be accountable to the law, then the best course of action is to not break it in the first place. Police officers understand that their profession is unique and that officers need to stick together if they are to be successful and stay safe. But they also are all too aware of the consequences of breaking laws—even traffic laws. Besides the legal consequences and the inconvenience of the out-of-pocket expense of a traffic ticket, there are real-world consequences when things go wrong. Laws are in place to keep people safe from harm. When officers fail to follow them, or fail to own up to their mistakes and refuse to accept the responsibility and consequences of their own actions, they cease to be part of the solution and start becoming part of the problem.